My new chunky cushions have been very popular this week. 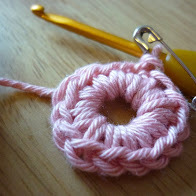 I am just in love with these colours and on a 6mm hook they can be made in just a couple of hours. The wool is from Herdy and is 100% British Wool (yes – “properly British” – from sheep reared and sheared right here in the UK), Herdy are based in Cumbria and make the cutest collection of products in addition to their range of wool. I first met them at Woolfest and loved them! No, the wool base isn’t Herdwick, but the wool is sourced in the UK and dyed in a vibrant range of colours. Some of the cushions are trimmed in undyed Herdwick (donated from my Mother in Law’s stash). You could say these are a truly Cumbrian product, made in Cockermouth, with wool from a Cumbrian company and trimmed with local wool. That’s not a bad provenance eh? I will be releasing the patterns for some of the cushions shortly. 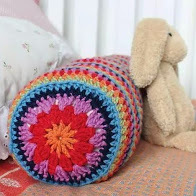 But, the “Big Granny” is easy to make for yourself without a pattern and I’ve written the instructions below so you can make one for yourself. You’ll need a 6mm hook and Herdy Wool in your favourite colours (if you want to make a plain or two colour square you’ll need two balls), a 35cm cushion pad and a couple of hours. 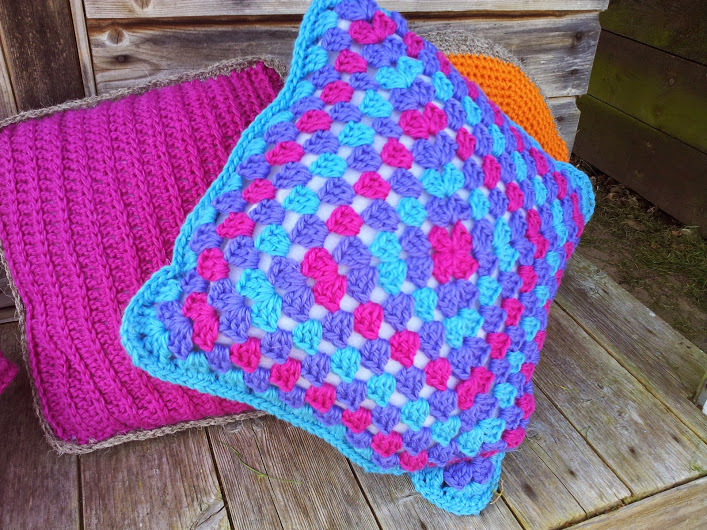 Follow your favourite granny square pattern until the square is just smaller than your cushion pad (that took 10 rounds for me). Fasten off yarn and weave in all your ends. For a larger cushion, just make more rounds. Join the two squares with a double crochet seam around three sides (worked with wrong sides together). Slip in the cushion pad and complete the seam around the last side. And that’s it, a simple cushion which will give any home the “Wow” factor! I also made some larger cushions by adding an extra round. 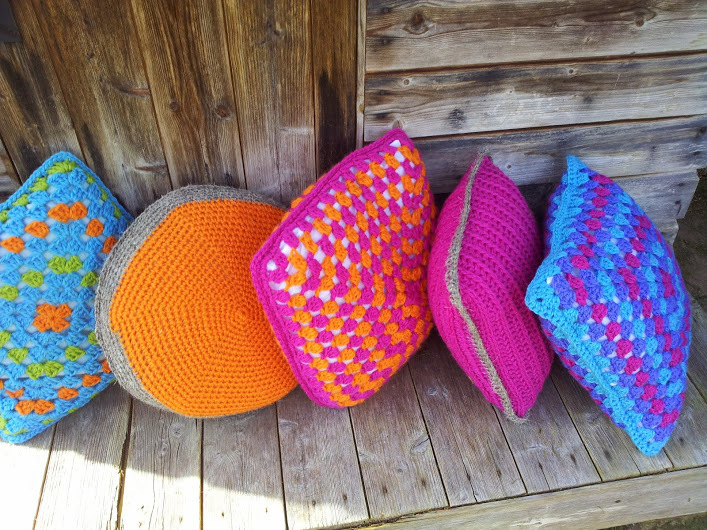 If you can’t crochet, don’t despair, the full range of cushions is for sale in Gallery Artemis, Main St, Cockermouth and they will be available in my Etsy shop very soon. 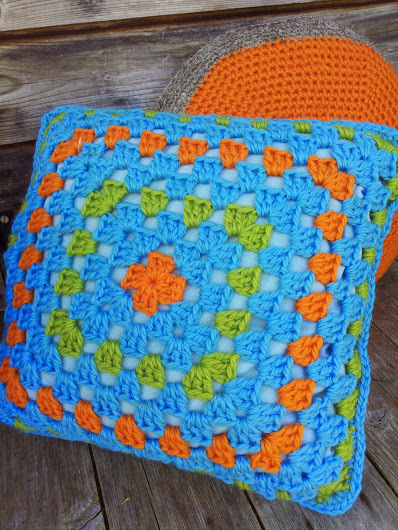 *You can find Sarah Shrimpton’s video on how to make a granny square here. 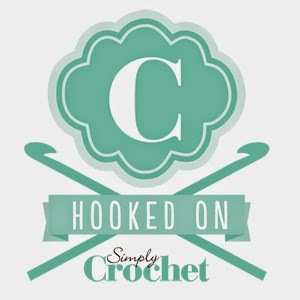 (A word of advice – despite the current trend to use a magic loop for all crochet in the round; for homewares and items which will get a lot of wear and tear (such as blankets and cushions) I still recommend the chain ring. It’s easy to make, secure and won’t work undone! If the worst does happen, Claire Montgomerie walks you through the perfect granny square repair here). You can buy Herdy Wool online from Baa Baa Brighouse, the friendliest online retailer and delivery is super speedy!.